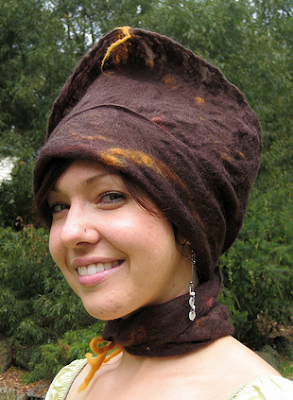 The Funky Felter: Handmade Wet Felted Woolly Hats! I'm in Hat Heaven this Friday! Handmade Wet Felted Woolly Hats! I'm in Hat Heaven this Friday! 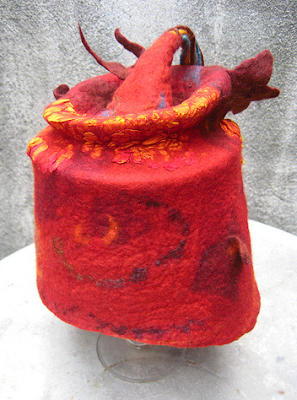 As some of you might know, I enjoy making needle and wet felted hats on occasion. Today I have been browsing the internet for inspiration and just to admire the wonderful variety of wet felted wool hats to be found. I thought that I'd share a couple of my favorites with you. I hope you enjoy seeing them. Have a wonderful weekend! This beautiful hat and neck wrap creation is by Judelicious Felts. I find her style to be very organic in shape and flattering to the model. You can see several more of her hats and accessories in her flickr photo gallery. She has a lovely variety of sizes, forms, and colors to see. This whimsical creation is by Melissa Kosmicki. The colors, form, and texture are quite interesting. It makes me think of something that is part royalty and part fantasy. You can find more of Melissa's fascinating hats in her flickr photo gallery. whoa! these are really cool! i like them a lot and had never seen them before! Fabulous works of art for the body!